Played at Paisley Golf Club on Sunday 22nd April, and once again generously sponsored by Greenlaw Garage, Paisley, www.greenlawgarge.com on a day when the weather returned to normal Scottish conditions of wind and rain, following the great weather of the previous day, the final of the Renfrewshire Golf Union Boys Champion of Champions took place. 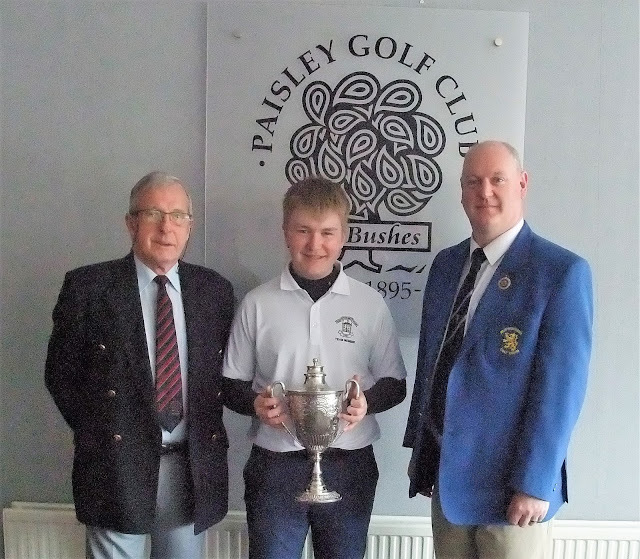 In the Final, Roddy McAuley (Fereneze), who is also champion at Caldwell, faced Patrick McCartney (Greenock) who was runner up in the Boys County Match Play in 2017. The game started in a peculiar fashion with Roddy going out of bounds at the first and second holes while Patrick was safely on the fairway at both holes. This gave Patrick an early 2 holes lead. The next hole was halved before Patrick went 3 up at the fourth when Roddy missed the green and failed to get up and down. The fifth and sixth were halved before Roddy won the seventh after Patrick unusually took 2 to recover from the greenside bunker. The lead was reduced to one when Patrick missed the green at the eighth hole and failed to recover for par. The ninth was halved in par with Patrick 1 up at the turn. The next four holes were all halved in what was now a very tight game with putts being missed by both players who were otherwise coping well with good golf in the poor weather conditions. The game went all square after both missed the green at 14 but Roddy made a good up and down. The fifteenth hole was halved and the telling blow came at the par 5 sixteenth with both players just short but Roddy making a good birdie with the only long putt seen all day to go one up. On the seventeenth, Roddy was safely on the green while Patrick missed on the right, and after he failed to get up and down Roddy safely took 2 putts to win the hole and the match by 2/1. The match was played in the best of spirits by two fine Renfrewshire boys. In the semi-finals played on Friday 20th Patrick McCartney beat Aaron McCue (Greenock Whinhill) 2 and 1 while Roddy McAuley beat Kenan Ingram (Port Glasgow) 5 and 3. On the previous Sunday, McAuley beat Mackenzie Holmes (Kilmacolm) 4 and 3, Ingram beat Cameron Lyle (Paisley) by onr hole and McCartney beat Euan English (Erskine) 2 and 1. Aaron McCue received a walk over when his opponent failed to make his tee-time. In the preliminary rounds Holmes beat David Tarvet (East Renfrewshire) at the 20th, Lyle beat Angus Frood (Ranfurly Castle) 4 and 3 and English beat Niall Gallagher (Gourock) by one hole.